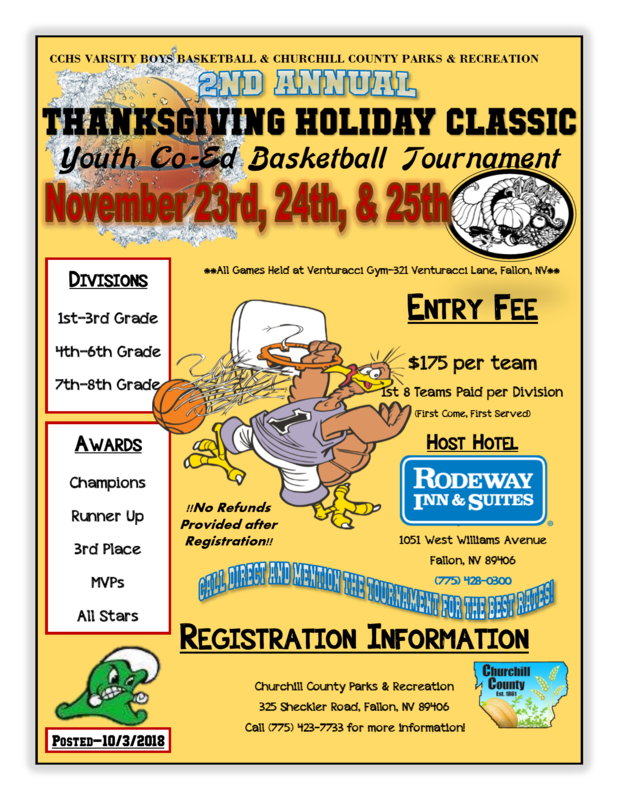 Churchill County Parks and Recreation - along with the Churchill County High School Boys Varsity Basketball Program - are excited to announce the 2018 Thanksgiving Holiday Classic Youth Co-ed Basketball Tournament. Due to Low Team Registration numbers in the 1st - 3rd and 4th - 6th division - these divisions will open with Round Robin play to ensure a guaranteed minimum of 3 games played per team prior to the start of the official tournament brackets. Win/Loses in Round Robin play do not count for or against your team in terms of advancement in the official tournament. Games times are listed separately on the brackets. Click here to print the flyer! Click here for a less colorful version! The cost is $175.00 per team. Awards for Champions, Runner-up, 3rd Place, MVP's, and All-Stars will be provided in each division. Entry deadline is November 1st or until all spots are filled. All games will be played at The City-County Gym at Venturacci Park located within the City of Fallon. The cost is $175 per team. 10 players maximum per team.